When a natural lake exists on an estate, or a brook bends its way through your garden, then this provides the ideal conditions for the formation of a water garden. When water has to be introduced, a considerable initial expense must be anticipated;, if the owner wishes to have a garden worthy of the name. The charm of the water garden lies in its cool appearance and the freshness of its vegetation during the hot summer days; therefore everything about it should be so arranged that it would be at its best from late spring until early autumn. A natural lake, fed by a stream, and having a natural outlet, forms the easiest kind of water garden to deal with, for it is usually easy so to modify the margins that they may be made suitable for such plants as grow in very shallow water or mud, whilst deeper water in the vicinity is available for Water-lilies and other plants needing fairly deep water. In introducing Water-lilies and other plants into lakes, the mistake is sometimes made of covering too great a space of water with foliage. This destroys much of the beauty of the lake, for the great charm of the water garden lies, not only in the plants, but also in the glimpses of water surface; therefore Water-lilies and other plants should be placed chiefly about the margins. Many people are not fortunate enough to possess natural lakes or streams capable of being easily turned into water gardens, and have to create them. The first thing is to find out what the possibilities are of a constant supply of fresh water throughout the year, whilst a means of disposing of surplus water is quite as essential. There can be nothing worse than a water garden with a bad water supply; if the water is not continually running, it quickly becomes foul, and is, in addition to being an eyesore, a source of danger to health in hot weather. 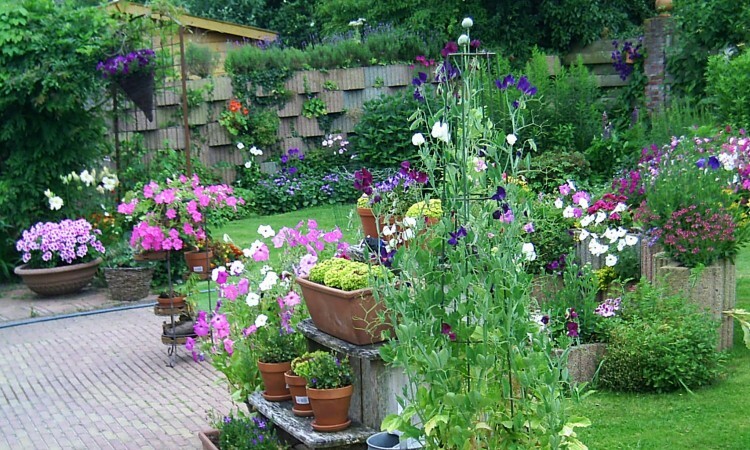 It is better by far to dismiss the idea of a water garden altogether if it is found to be impossible to obtain the necessary supply of fresh water. This may sometimes be obtained from a distance, by the use of a small dam. working in some river or brook, and is perhaps the only practical means of obtaining water unless a water main runs through the neighborhood; then the expense would probably be prohibitive in keeping a lake of any considerable size supplied. In some gardens the water garden is reduced .to the proportions of a large tank; then the question of a water supply is less serious, for a comparatively small quantity keeps it going, though the smaller the tank, the more often should it be emptied and refilled with fresh water. Whenever possible, ponds or tanks made for the reception of water plants should be so arranged that they can be emptied at will, for at least once a year it is a good plan to clean out the mud. If your are assured you want a water garden without a fresh water supply, I recommend following this process. The arrangement of an artificial water garden needs some thought. Should the owner wish to have his plants immediately under his eye, it must be fairly narrow. At Aldenham House a water garden in the form of a canal exists. Along each side there is a grass path, and visitors may see every plant conveniently. It might be thought that the formal outline would have an unsightly effect, but this is not the case, for by a judicious arrangement of the plants about the margins the straight sides are not noticeable. A pond, 2 to 2.5 feet deep, with boggy margins, is another suitable form of water garden, whilst a tank or tanks may be favored in such gardens where the requirements of the plants, rather than landscape effect, are given consideration. Water 2.5 feet deep is all that is needed if the garden is to be kept attractive; a man must get into the water to remove dead leaves, flowers, and other rubbish at least once a week. Moreover, a greater depth of water is not necessary, and only adds to the expense of making and upkeep. As a general rule. 2 feet of water will be ample. After the water garden has been excavated to the necessary depth it must be made water-tight, either by pudding with clay or by building up with concrete and cement, or with concrete, brick walls and cement. The larger the pond the stronger must be the bottom and sides. If really stiff clay can be obtained it is as good as anything to use for a pond of large size, but for a tank or very small garden it is better to rely on concrete and cement. A layer of clay 9 inches thick is placed all over the bottom and the lower parts of the sides. On the sides, however, it may be gradually reduced in thickness until it is about 4 inches thick near the water surface. Before being used the clay must be thoroughly broken up and puddled to make sure that there are no lumps left, and that it will work easily. A commencement is then made in the middle of the pond by placing in 6 inches of clay. This by the aid of water should be well trodden or pounded into place. Then more clay is added, and again pounded until a sufficiently thick layer is formed. The surface is smoothed over with the back of a wet shovel or spade, and as the work proceeds small mounds of loam are made for the various plants. During the progress of the puddling the clay must be kept wet, for if it is allowed to dry at all cracks will occur. When the work is finished the plants are inserted in the beds of soil and the water run in. When a concrete and cement tank is to be formed, it is usually advisable to call in a builder to do the work, for great strength is necessary, and inexperience will probably result in a bottom and sides which will not hold water, and may cause endless future trouble.